Keep your critical operations running efficiently with Zebra's durable ZT400 Series printers - designed for years of performance in a wide array of applications. 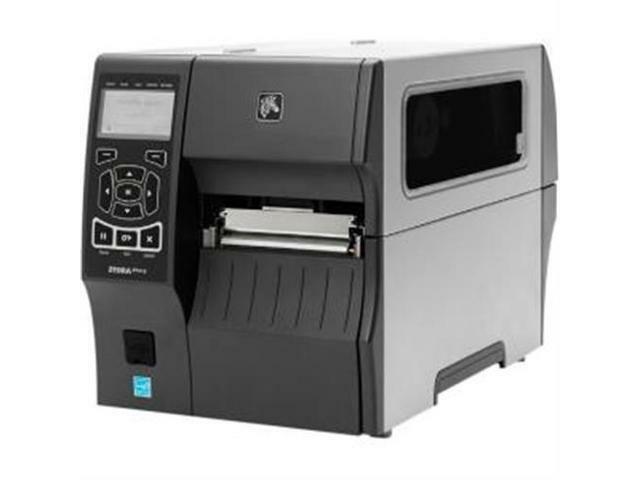 The ZT400 Series is offered in both 4" and 6" models and comes standard with an extensive set of advanced features that ensure your printer investment will always meet your needs, now and in the future. Constructed using an all-metal frame and bi-fold door, this printer is designed to fit well in space-constrained environments. Featuring Zebra's Link-OS® environment - an innovative operating system combining a powerful Multiplatform Software Development Kit (SDK) and software applications - ZT400 Series printers are easy to integrate, manage and maintain from any location around the globe. Designed to grow with your evolving business needs. The ZT400 features increased processing capabilities and an open operating and changing application requirements. Expand your printing readiness through an exceptional range of media capabilities and media delivery options. Customize your printer to match your current and future business needs with end-user-installable media handling options. Standard Serial, USB, Ethernet and Bluetooth features - as well as two open media slots - allow you to utilize non-standard connectivity options. Expanded RFID capabilities are easy to install and simple to use. Ensure quality output for small-label applications with high-resolution printing capabilities. USB host port enables simple printer configuration by easily transferring data from a USB flash drive via mirroring and expanded mapped-drive memory capabilities. Virtual Devices apps enable Link-OS printers to support well-known legacy and competitor printer languages - in addition to ZPL® and EPL™ - for a future-proofed investment. Dynamic QR codes provide on-demand, web-based support to resolve printer errors quickly. Print Touch-enabled Link-OS printers offer web page launching features using Near Field Communication (NFC), making it easy to access Zebra's extensive knowledge base of how-to videos and product support. Lighted media and ribbon paths make it easy to see inside the printer, even in poorly lit environments. Zebra's Link-OS environment delivers enhanced capabilities to monitor, manage and maintain your printer from any location. Cloud Connect allows Link-OS printers to securely and directly interact with the Cloud for printing and device management. Profile Manager enables you to edit and manage one printer, batches of printers or all Link-OS printers across your network anywhere in the world. With a print width of four inches, the ZT410 has print speeds up to 14ips and offers high-resolution (600dpi) printing for small-label applications. Maximum Print Width 4" 6"
19.50" x 12.75" x 10.60"